Rambo wrote: Maybe that's why S2's are (alleged) to be slower ? A lump of 4 x 4 must be heavier than fibreglass. I had noticed the galvanized steel bracket too. Or is it passivated zinc /?? S2's are slower according to all the data of various road tests. 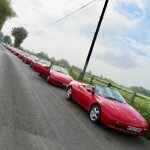 Autocar tested an SE in 1990 and recorded 0-60 mph in 6.5 seconds using their 5th wheel (indicating 63 mph on speedo). Standing 1/4 mile 15 seconds with terminal speed of 92 mph. They tested an S2 in 1994 and recorded 0-60 mph in 7.3 seconds, standing 1/4 mile 15.8 seconds but no terminal speed was quoted. In the '94 article it says " But right across the board it proved slower than it's marginally lighter, more powerful predecessor. And not just by a small amount but massively so in some areas. To 60 mph it is almost a second adrift, to 100 mph it is a scarcely believable four seconds slower and in each in-gear increment it is beaten hollow by its non-catalysed forebear." But the '94 article had a subheading of "It may be slower than before and no more adjustable, but the S2 is a better driver's car". In the article it seems the 7" wide 16" wheels and uprated suspension to deal with the increased weight made a nicer car to drive from the testers viewpoint, even if it was a lot slower. So it's 'horses for courses'... Elan driving isn't about straight line speed anyway, is it? I think an S2 without the pre-cat and cat brings it close to the SE. The SE might also run a richer mixture and benefit from the increased power that brings. Not that I'm superficial or anything, but the S2 has some funky colours which many might prefer. And the S2 has a funny handbrake lever which drops out of the way when it is engaged. Had a good weekend, enjoyed seeing the fellas that turned up and got a very descriptive lesson on how to change the cam belt from pinky and flasher. Also some interesting racing and this time I walked around the whole track, which was more enjoyable than one would expect. I hope the rumors of this being the last festival in Brand's hatch not become a reality. As I still haven't done a parade lap in the circuit. Prefer the se mainly because it's easier to get past the mot emissions. Although the extra power is always welcome. Shame I missed seeing you all, and really hope they don't stop the event. So much going on the same Bank Hol weekend that perhaps changing the date would attract more?? Wings & Wheels was great and Oulton Park looked fab too. GeoffSmith wrote: And an excellent day for watching the football. Still an excellent day Alan. How's your bum? Squeaking yet?